After breaking ground nearly 18 months ago, Delta completed construction on the world’s largest jet engine test cell this month. Standing 48 feet tall, with inlet and exhaust sections measuring 66 feet and 78 feet respectively, the test cell is capable of safely running a mounted, stationary engine at full power with 150,000 pounds of thrust. To compare, the airline’s current test cell has a 68,000 pound thrust capacity. The test cell will provide capabilities to test a new assortment of engines that will advance Delta into the future. With its 150,000 pound thrust capacity, the cell will open the door to many new, larger engine testing capabilities, including the Trent 1000, 7000 and XWB and the PW1100 and PW1500 variants of the Geared Turbofan. The ability to test larger engines reinforces Delta’s commitment to offering repair capabilities for newer engine models and helps facilitate future demand. 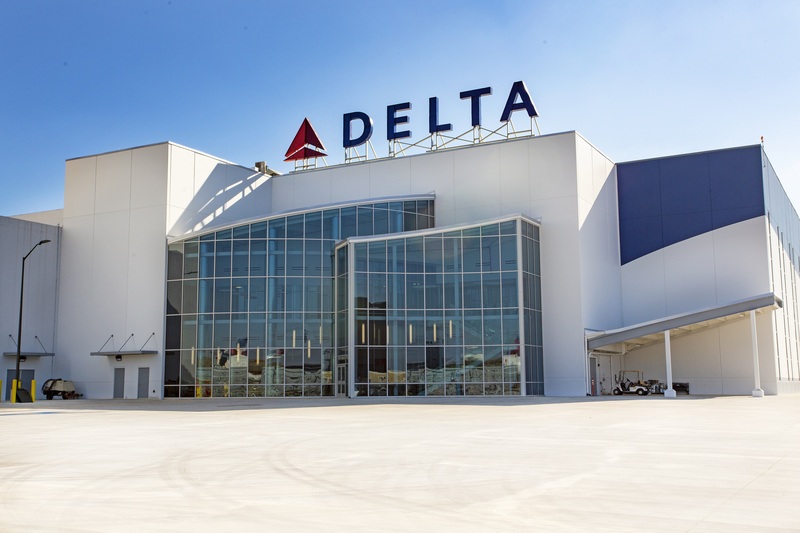 Delta will host the official grand opening of the test cell in February. Additional next steps include the proving and data validation for the cell, the commissioning of the cell with the Trent XWB engine, Trent 1000 Electric Start System installation, the Trent 1000 commissioning, correlation and production test, with the first production test taking place in late 2019. The new state-of-the-art test cell is the first cell built by a U.S. airline in more than 20 years. In October 2015, Delta and Rolls-Royce signed a formal agreement for Delta TechOps to become an Authorized Maintenance Center for Rolls-Royce engines. Under the agreement, the airline will provide engine services for the latest generation Trent XWB, Trent 1000 and Trent 7000, in addition to the BR715, which had already been added to engine capabilities. As one of the largest aviation maintenance groups in North America, Delta TechOps‘s highly skilled workforce of over 10,000 technicians, engineers and other support employees provide full-service maintenance to more than 850 Delta aircraft and their engines as well as maintenance services to more than 150 other operators, cargo operators and the military and government, through the airline’s Maintenance Repair and Overhaul business.